Salads and slaws aren't just for summer! 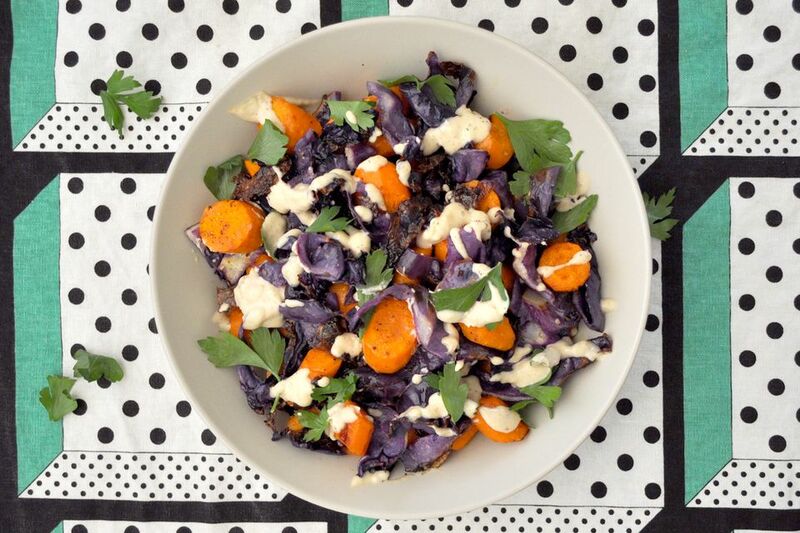 Bring your salad game into the cooler months by using autumnal ingredients like carrots and cabbage and roasting them. A quick trip in a high-heat oven lightly caramelizes the veggies while keeping them snappy, and a creamy roasted garlic and tahini dressing is drizzled on top. Tahini is a creamy sesame seed paste, and can be found in the international section of your grocery store, near the peanut butter, or in the condiment aisle. A dose of lemon and a handful of parsley keeps things fresh. Serve warm alongside lamb chops or roast pork loin for a satisfying fall meal. Or turn this salad into a one-dish meal by tossing with arugula and a cooked grain like barley. Toss the cabbage and carrots with two tablespoons of oil on a large rimmed baking sheet. Spread out into a single layer and sprinkle with the red pepper flakes and season generously with salt and pepper. Add the garlic cloves and 1/4 teaspoon of oil to a square of aluminum foil and ball it up to seal the cloves inside. Add to the baking sheet. Roast for about 10 minutes, or until the veggies are lightly charred but the carrots are still firm. Carefully remove the garlic from the aluminum foil and push the cloves out of the skins using a knife. Press with the knife blade to create a paste. In a small bowl, mix the garlic paste, tahini, lemon juice and honey. Season with salt and pepper. The mixture will thicken. Add up to 1/2 cup of hot water, a tablespoon at a time, until the desired consistency is reached. Top the veggies with fresh parsley and drizzle with the tahini sauce.